Opening round of the AMA National Adventure Ride Series! April 13th and 14th 2019, outside of Bybee TN. Lots of jeep and logging roads, and rural pavement! All street legal bikes welcome! Primitive camping available. Pre-entry by April 10th gets a free t-shirt and Saturday dinner, plus a 10% discount! Pre-enter by 4/10/19 for $90, $100 post entry. Info and contacts on the flyer! 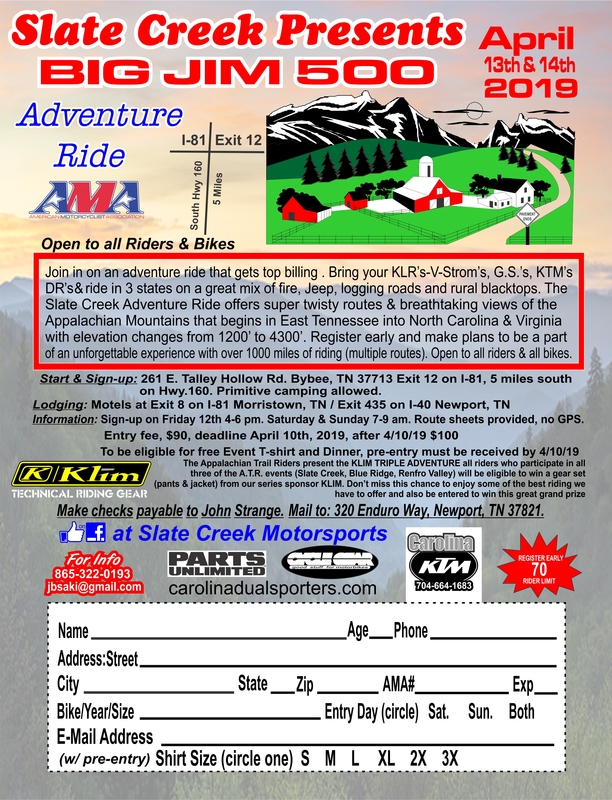 2019 Big Jim 500 Adventure Ride flyer, CLICK HERE! 2 new routes have been added for a total of 6 available!